This product includes a digital copy of our Family Field Guide along with the purchase of Blaze New Trails. Discover the power of nature and community. Blaze New Trails will show you how learning is all around you. This book is for K-8 and beyond. It takes the place of nature study, science and life skills in the elementary years. We touch on history and literature for good measure as well. Holly has written a comprehensive guide that is the perfect place to begin discovering your children’s talents. It is filled with encouragement and inspiration for parents, stories of the Giles family’s homeschooling experience, along with lessons, activities, and hands-on projects for the whole family. She will guide you through your local park with history, science, and literature. Make your farmer’s market an outdoor classroom and learn how entering your county fair is a complete educational course for a year. Holly provides you with worksheets, book lists, interviews and ideas to take you through a year-long adventure right outside your front door! Follow Holly’s personal journey through home education that taught her and her children how to make education a lifestyle that creates lasting memories as a family. This book contains references to places in the state of Florida where the author resides, however, all the chapters, lessons, worksheets and ideas can be completed in ANY state or location. 239 pages. Full-color interior product. Comb bound. Lesson planner is included in the book that guides you through using Blaze New Trails over 45 weeks. Blaze a trail with YOUR family’s name on it! Each purchase includes the Family Field Guide digital download. 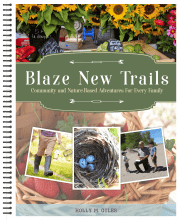 This is more information, printables, and videos to help you make the most of Blaze New Trails. This will be emailed to each purchaser. “Early in my journey of parenthood, the outdoors was a respite for us. As a baby my first born, Grayson was soothed by the breeze, the birds and our backyard swing. I naturally assumed his growing curiosity for the outdoors was because we spent so much time on it! As we ventured into schooling at home, my second son was born. In my quest for them to sit at a desk and fill in the blanks, I quickly realized that traditional learning was not the right fit for our family. So, we went back to the swing. Reading aloud became our curriculum, along with the bugs, dirt and any local spot that could teach us something new. It was math at the farmer’s market, science at the boat ramp and history at a state park. Our home education became a way of life, in the errands we ran, people we met and opportunities that came our way.